The resinous exudates from Escallonia illinita by products was characterized by FT-IR, NMR and HRMS. Six compounds were isolated and identified as follows: 1,5-diphenylpent-1-en-3-one (1), 4-(5-hydroxy-3,7-dimethoxy-4-oxo-4H-chromen-2-yl)phenyl acetate (2), pinocembrin (3), kaempferol 3-O-methylether (4), (3S,5S)-(E)-1,7-diphenylhept-1-ene-3,5-diol (5) and the new diarylheptanoid (3S,5S)-(E)-5-hydroxy-1,7-diphenylhept-1-en-3-yl acetate (6). The anti-oomycete potential of the resinous exudate, as well as the main compounds, was tested in vitro against Saprolegnia parasitica and Saprolegnia australis. The resinous exudate showed a strong anti-oomycete activity. In addition, the compounds 6, 1 and 3 demonstrated significant inhibition of Saprolegnia strains development. These findings strongly suggest that E. illinita is a potential biomass that could be used as a natural anti-oomycete product. The genus Saprolegnia belongs to the group of heterotrophs known as oomycetes, commonly called water molds, which are saprophytes or parasites targeting a wide range of hosts . They are a very important fish pathogen, especially on catfish, salmon and trout species, and that attacks even crustaceans and amphibians of hatchery [2–4]. As a consequence diseases caused by these oomycetes produce considerable losses in world aquaculture [5, 6], especially on salmon farming because it infects adults and eggs . Saprolegnia sp. has traditionally been controlled by commercial fungicides (malachite green, formalin, hydrogen peroxide and bronopol) [8, 9]. However, the use of these fungicides has caused serious problems such as the appearance of highly resistant strains, and the contamination of environment [10, 11]. The intrinsic need to seek and develop new oomycides is not only due to these fungicide-resistant strains, but also due to the demand for organically grown foods, which is rapidly increasing because of concerns about human health and environmental quality . Thus, there is a growing trend towards using natural products, regarded as environmentally friendly alternatives to synthetic fungicides or oomycides for the protection of the fish farming against water molds caused by members of the genus Saprolegnia. Little information is available in the literature on anti-oomycete activity of natural products against Saprolegnia sp. Some flavonoids , chalcones [14–16], phenylpropanoids , essential oil [18, 19] and seaweed extracts  have effect against these oomycetes. The resinous shrub Escallonia illinita Presl., which is widely distributed in south central of Chile, is widely used by traditional Chilean medicine “barraco”. It was used as folk medicine for immune-modulation, anti-tumor, anti-fungal and anti-bacterial . Previous studies on this plant revealed that the aqueous and hydroalcoholic extracts of E. illinita showed significant anti-viral, anti-fungal, anti-bacterial and anti-parasitic activities in vitro [22, 23]. To further investigate the constituents and screen the bioactive constituents from the resinous exudate of this herbal medicine, a phytochemical study was performed that resulted in the isolation of one new compound, along with five known components. Herein, we report the isolation, structural elucidation, and anti-oomycete activity of compounds 1–6. Unless otherwise stated, all chemical reagents purchased (Merck, Darmstadt, Germany or Aldrich, St. Louis, MO, USA) were of the highest commercially available purity and were used without previous purification. IR spectra were recorded as thin films in a FT-IR Nicolet 6700 spectrometer (Thermo Scientific, San Jose, CA, USA) and frequencies are reported in cm−1. 1H and 13C spectra were recorded on a Bruker Avance 400 Digital NMR spectrometer (Bruker, Rheinstetten, Germany), operating at 400.1 MHz for 1H and 100.6 MHz for 13C. Chemical shifts are reported in δ ppm and coupling constants (J) are given in Hz. HREIMS were measured on Thermo Finnigan MAT95XL mass spectrometers. Silica gel (Merck 200–300 mesh) was used for C.C. and silica gel plates HF 254 for TLC. TLC spots were detected by heating after spraying with 25% H2SO4 in H2O. Aerial parts of E. illinita were collected in Limache, Valparaíso Region, Chile, in November of 2017. A voucher specimen (VALPL 2155) was deposited at the VALP Herbarium, Department of Biology, Universidad de Playa Ancha, Valparaíso, Chile. Fresh E. illinita (800 g) aerial parts were extracted with cold dichloromethane (5 L) at room temperature for 45 s that produced (12.3 g) of the resinous exudate with w/w yield of 15.38%. Later, the resinous exudate (5.00 g) was fractionated by column chromatography on silica gel using n-hexane–ethyl acetate (100:0 to 0:100, v/v) to obtain five major Fractions A, B, C, D and E, respectively. Fr. A (1.26 g) was further purified by column chromatography on silica gel eluting with n-hexane–ethyl acetate (8:2, v/v) to give compounds 1 (71.50 mg) and 2 (64.59 mg). Fr. B (1.08 g) was separated by column chromatography on silica gel eluting with n-hexane–ethyl acetate (7:3, v/v) to three fractions were obtained: fraction I (120.59 mg) of compound 3, fraction II (419.91 mg), a mixture of compounds, subsequently derivatized and fraction III (188.61 mg) of compound 4. Fr. C (912.03 mg) was subjected to column chromatography on silica gel eluting with n-hexane–ethyl acetate (9:1, v/v) to give compounds 3 (193.75 mg) and 4 (40.36 mg). Compound 5 (152.60 mg) was precipitated from Fr. D (436 mg) using MeOH. Fr. E (717 mg) was purified by column chromatography on silica gel eluting with n-hexane–ethyl acetate (4:6, v/v) to give compound 6 (127.40 mg). White solid. m.p. : 54–55 °C. IR ν/cm−1: 2928 (C–H), 1625 (C=O), 1605 (C=C). 1H NMR (400 MHz, CDCl3) δ/ppm: 7.46 (d, J = 7.0 Hz, 2H, H-2′ and H-6′); 7.34 (m, 3H, H-3′, H-4′ and H-5′); 7.21 (m, 4H, H-2″, H-3″, H-5″ and H-6″); 6.90 (m, 2H, H-1 and H-4″); 6.28 (b.d., J = 15.4 Hz, 1H, H-2); 2.95 (m, 4H, H-4 and H-5). 13C NMR (100 MHz, CDCl3) δ/ppm: 199.4 (C-3); 141.4 (C-1); 141.2 (C-1″); 136.0 (C-1′); 129.5 (C-3′ and C5′); 129.2 (C-4′); 128.5 (C-3″ and C-5″); 1128.4 (C-2″ and C-6″); 127.2 (C-2′ and C-6′); 126.6 (C-4″); 126.1 (C-2); 42.3 (C-4); 30.2 (C-5). HREIMS: M+H ion m/z 237.3083 (calcd. for C17H16O: 236.3145). Colorless solid. m.p. : 165–166 °C. IR ν/cm−1: 3280 (O–H), 1670 (C=O), 1610 (C=C), 1310 (O–C). 1H NMR (400 MHz, CDCl3) δ/ppm: 12.55 (s, 1H, OH), 8.12 (s, 2H, H-2′ and H-6′), 7.26 (s, 2H, H-3′ and H-5′), 6.45 (s, 1H, H-8), 6.37 (s, 1H, H-6), 3.88 (s, 6H, 2xOCH3), 2.35 (s, 3H, OAc). 13C NMR (100 MHz, CDCl3) δ/ppm: 178.9 (C-4), 169.0 (OAc), 165.6 (C-5), 156.8 (C-10), 154.9 (C-2), 152.4 (C-4′), 139.7 (C-3), 129.8 (C-2′ and C-6′), 128.0 (C-1′), 121.9 (C-3′ and C-5′), 106.2 (C-9), 98.0 (C-6), 92.2 (C-8), 60.4 (OCH3); 55.8 (OCH3), 21.2 (CH3). HREIMS: M+H ion m/z 357.3325 (calcd. for C19H16O7: 356.3261). Colorless solid. [α]D20 = − 45.3° (c = 0.9, acetone). m.p. : 190–191 °C. IR ν/cm−1: 3230 (O–H), 1660 (C=O), 1620 (C=C). 1H NMR (400 MHz, CDCl3) δ/ppm: 12.15 (s, 1H, OH), 9.83 (b.s., 1H, OH), 7.42 (m, 5H, H-2′, H-3′, H-4′, H-5′ and H-6′), 6.00 (s, 2H, H-6 and H-8), 5.40 (dd, J = 13.2 and J = 2.4 Hz, 1H, H-2), 3.10 (dd, J = 17.1 and J = 13.6 Hz, 1H, H-3α), 2.80 (dd, J = 17.1 and J = 2.6 Hz, 1H, H-3β). 13C NMR (100 MHz, CDCl3) δ/ppm: 196.8 (C-4), 167.3 (C-7), 165.3 (C-5), 164.9 (C-9), 140.0 (C-1′), 129.4 (C-3′, C-4′ and C-5′), 127.3 (C-2′ and C-6′), 103.1 (C-5), 96.8 (C-6), 95.9 (C-8), 79.9 (C-2); 43.6 (C-3). HREIMS: M+H ion m/z 257.2584 (calcd. for C15H12O4: 256.2534). White solid. m.p. : 271–272 °C. IR ν/cm−1: 3230 (O–H), 1660 (C=O), 1620 (C=C). 1H NMR (400 MHz, CDCl3) δ/ppm: 12.78 (s, 1H, OH), 8.02 (s, 2H, H-2′ and H-6′), 7.00 (s, 2H, H-3′ and H-5′), 6.49 (s, 1H, H-8), 6.25 (s, 1H, H-6), 3.85 (s, 3H, OCH3). 13C NMR (100 MHz, CDCl3) δ/ppm: 176.0 (C-4), 164.1 (C-7), 162.6 (C-4′), 160.6 (C-5), 158.0 (C-10), 149.5 (C-2), 136.8 (C-3), 131.1 (C-2′ and 6′), 122.5 (C-1′), 116.3 (C-3′ and C-5′), 103.0 (C-9), 98.3 (C-6), 94.5 (C-8), 60.2 (O–CH3). HREIMS: M+H ion m/z 301.3681 (calcd. for C16H12O6: 300.2629). Colorless needles. m.p. : 75–77 °C. [α]D23 =+ 25.19° (c = 0.63, MeOH). IR ν/cm−1: 3540 (O–H), 1640 (C=C). 1H NMR (400 MHz, CDCl3) δ/ppm: 7.38 (d, J = 7.3 Hz, 2H, H-2′ and H-6′), 7.24 (m, 5H, H-3′, H-4′, H-5′, H-3″ and H-5″), 7.21 (m, 3H, H-2″, H-4″ and H-6″), 6.63 (d, J = 15.8 Hz, 1H, H-1), 6.27 (dd, J = 6.1 and J = 15.8 Hz 1H, H-2), 4.80 (b.s., 1H, OH), 4.67 (m, 1H, H-3), 4.03 (m, 1H, H-5), 2.81 (m, 1H, H-7α), 2.65 (m, 1H, H-7β), 2.49 (b.s., 1H, OH), 1.85 (m, 2H, H-4), 1.79 (m, 2H, H-6). 13C NMR (100 MHz, CDCl3) δ/ppm: 141.9 (C-1″), 135.6 (C-1′), 131.8 (C-2), 130.1 (C-1), 128.6 (C-3′ and C-5′), 128.5 (C-2″, C-3″, C-5″ and C-6″), 127.7 (C-4′), 126.5 (C-2′), 125.9 (C-4″), 70.7 (C-3), 68.9 (C-5), 42.6 (C-4); 39.2 (C-6), 32.1 (C-7). HREIMS: M+H ion m/z 283.3834 (calcd. for C19H22O2: 282.3768). White needles. m.p: 89–91 °C. [α]D23 = + 25.09° (c = 0.63, MeOH). IR ν/cm−1: 3330 (O–H), 1690 (C=O), 1610 (C=C). 1H NMR (400 MHz, CDCl3) δ/ppm: 7.36 (d, J = 7.8 Hz, 2H, H-2′ and H-6′), 7.26 (m, 5H, H-3′, H-4′, H-5′, H-3″ and H-5″), 7.17 (m, 3H, H-2″, H-4″ and H-6″), 6.55 (d, J = 15.8 Hz, 1H, H-1), 6.07 (m, 1H, H-2), 5.68 (m, 1H, H-3), 3.53 (m, 1H, H-5), 2.97 (b.s., 1H, OH), 2.81 (m, 1H, H-7α), 2.65 (m, 1H, H-7β), 2.03 (s, 3H, CH3), 1.79 (m, 2H, H-4), 1.68 (m, 2H, H-6). 13C NMR (100 MHz, CDCl3) δ/ppm: 171.7 (OAc), 142.0 (C-1″), 135.9 (C-1′), 131.6 (C-1), 129.4 (C-3′ and C-5′), 128.6 (C-2′ and C-6′), 128.5 (C-2″, C-3″, C-5″ and C-6″), 128.3 (C-4′), 127.6 (C-2), 125.8 (C-4′’), 68.6 (C-3), 66.6 (C-5), 43.3 (C-4); 38.6 (C-6), 32.1 (C-7), 21.1 (COCH3). HREIMS: M+H ion m/z 325.4211 (calcd. for C21H24O3: 324.4134). Pure strains of S. parasitica and S. australis were received from the Cell Biology Laboratory, Faculty of medicine, Universidad de Valparaíso, placed on potato dextrose agar (PDA) slants, and stored at 4 °C. This pure strain was isolated from Salmo salar carp eggs . The method used in this study for anti-oomycete activity assay was performed according to methods previously reported . The resinous exudates and the compounds 1–6 were tested at 200.0, 150.0, 100.0, 50.0, 25.0, 12.5, 6.3, and 3.1 µg/L to find a preliminary minimum inhibitory concentration (MIC) interval. The MIC values were recorded visually on the basis of mycelia growth. All the independent experiments were conducted three times with quadruplicates at each test concentration. Ethanol solution 1% in water was the negative control and bronopol, clotrimazole, and itraconazole were the positive controls. The spore germination assay against Saprolegnia strains was performed according to the agar dilution method . The minimum oomyceticidal concentration (MOC) and detailed protocols for the biological assays was defined previously . Inhibition of mycelial growth was assayed using the method described  with small modifications. Oomycete growth was measured as the colony diameter, and toxicity of the resinous exudates and the compounds 1–6 against Saprolegnia strains was measured in terms of the percentage of mycelia inhibition by a formula described in detail elsewhere . Synergy between more bioactive compounds of resinous exudate was tested using the checkerboard microtiter assay [24, 25]. To detect a possible reduction of the MIC values of each compound when used in combination, twofold serial dilutions of one compound were tested against twofold serial dilutions of the other compound. Results were expressed as the FIC index according to the following formula. where, MICA and MICB are the MICs of compounds A and B tested alone, and where (A) and (B) are the MICs of the two compounds tested in combination. An FIC index of 0.5 indicates strong synergy (representing the equivalent of a fourfold decrease in the MIC of each compound tested), while an FIC index of 1.0 indicates that the antimicrobial activity of the two compounds are additive (i.e. a twofold decrease in the MIC of each compound tested). Determinations of MIC, MOC, cellular leakage, MGI, and FIC were performed in triplicate and the results are expressed as mean values ± SD. The results were analyzed by the standard method . 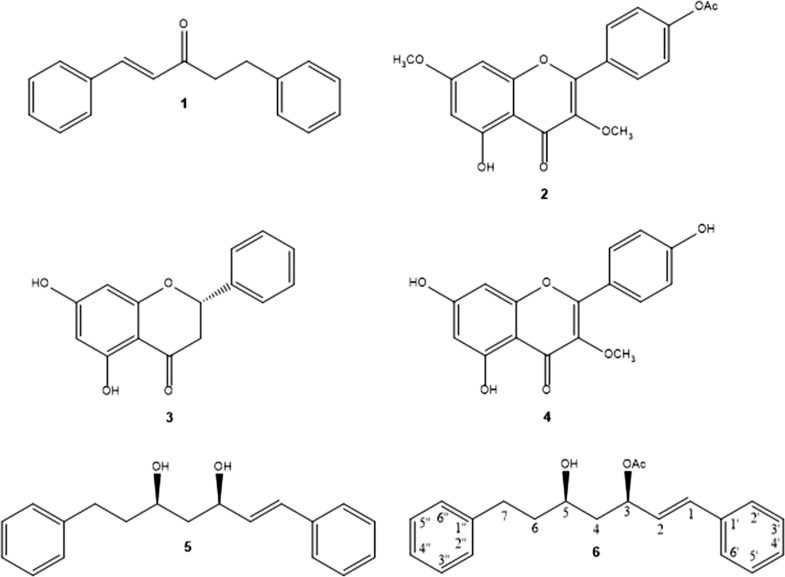 Searching for novel bioactive substances from medicinal plant E. illinita against strains of Saprolegnia parasitica and S. australis, five known compounds (1–5) were isolated from the resinous exudate of E. illinita by using various chromatographic methods, with one new acetylated diarylheptanoid, (3S,5S)-(E)-5-hydroxy-1,7-diphenylhept-1-en-3-yl acetate (6) (Fig. 1). The structures of the known compounds 1,5-diphenylpent-1-en-3-one (1), 4-(5-hydroxy-3,7-dimethoxy-4-oxo-4H-chromen-2-yl)phenyl acetate (2), pinocembrin (3), kaempferol 3-O-methylether (4), (3S,5S)-(E)-1,7-diphenylhept-1-ene-3,5-diol (5) were determined by comparison to the 1H- and 13C-NMR spectral data in the literatures [26–30]. Compound 6 was isolated as a pale yellow solid of molecular formula C21H24O3. The 1H and 13C NMR spectra of 6 were very similar to those of 5. However, the 1H NMR spectrum of 6 indicated the presence of two phenyl groups (δ: 7.36–7.17 ppm, 10 H), a pair of trans olefinic protons (δ: 6.55 and 6.07 ppm, J = 15.8 Hz), one proton of acetylated methine (δ: 5.68 ppm) and one hydroxylated methine (δ: 3.53 ppm). One of olefinic protons (δ: 6.07 ppm) was coupled with the acetylated methine proton (δ: 5.68 ppm). In addition, the 1H NMR spectrum showed that the hydroxylated and acetylated protons are neighbors to the protons at δ: 1.69–1.78 ppm, not the protons at δ: 2.65–2.81 ppm. The 13C NMR spectrum of the compound 6 indicated the presence of three methylenes (δ: 32.1, 38.6 and 43.3 ppm), one (δ: 66.6 ppm) hydroxylated methine and one (δ: 68.6 ppm) acetylated methine, a carbonyl group (δ: 171.7 ppm), a methyl group (δ: 21.1 ppm), two unhydrogenated sp2-carbons (δ: 129.4 and 131.6 ppm), and twelve sp2-carbons bearing a hydrogen. The structure of compound 6 was unequivocally assigned from 2D HSQC and HMBC spectra data. Thus, for compound 6, the signals at δH: 6.55 ppm (d, J = 15.8 Hz, 1H, H-1) showed 3JH–C HMBC correlations with C-2′ and C-6′ (δC: 128.6 ppm) and C-3 (δC: 68.6 ppm) and 2JH–C correlation with C-1′ (δC: 135.9 ppm) and C-2 (δC: 127.6 ppm) also were observed. Thus, the structure of 6 was concluded to be trans-5-hydroxy-1,7-diphenylhept-1-en-3-yl acetate. This conclusion was also supported by saponification of 6 with sodium carbonate to afford the diol derivate 5, which gave the same spectral data. Thus, compound 6 was unambiguously assigned the depicted structure (see Additional file 1). Anti-oomycete activity of the resinous exudate obtained from E. illinita against S. parasitica and S. australis in different concentrations was expressed as the minimum inhibitory concentrations (MIC), the minimum oomycidal concentrations (MOC) and the membrane damage (Table 1). Table 1 showed that the resinous exudate exhibited strong activity against both strains, with MIC and MOC values of 75 µg/mL. Here, the membrane damage percentage of resinous exudate was 72% for S. parasitica and 75% for S. australis, thus demonstrating the potency of E. illinita as anti-oomycete agent. Therefore, the resinous exudate could become a very important natural anti-oomycete agent. In addition, a comparison with a commercial oomycide (Bronopol) that provides total inhibition at 175 µg/mL suggests that the anti-saprolegnia activity of E. illinita resin is comparable (Tables 1 and 2). Thus, to reduce chemical inputs, the resinous exudate of E. illinita could constitute a complementary strategy to the use of pesticides against downy mildew. To explain its anti-oomycete activity, the main compounds of resinous exudate were tested against Saprolegnia sp. The compounds with the ability to inhibit S. parasitica and S. australis development (MIC and MOC values) were compound 6 (50 and 75 µg/mL respectively), compound 1 (100 and 125 µg/mL respectively), and pinocembrin 3 (125 and 150 µg/mL respectively). Furthermore, membrane damage caused by compounds 1 and 3 varied between 40 and 50% for S. parasitica and 43–53% for S. australis; in contrast, compound 6 exerted most membrane damage for both Saprolegnia strains (Table 1). The other compounds did not present inhibitory effects. Then, the effects on sporulation were assessed by exposing mycelial colonies to resinous exudates and natural compounds and the number of zoospores released was calculated after 48 h (Table 2). The results of this assay confirmed effectiveness of E. illinita resinous exudates and compound 6, 1 and 3 against both pathogenic strains, as compared to the other compounds and a positive control, such as bronopol, fluconazole, ketoconazole, and safrole [8, 19, 31]. These results are in agreement with those described by other authors. Indeed, the new diarylheptanoid 6 belongs to the family of linear diarylheptanoids which have been isolated from various sources, can be easily synthesized, and have shown diverse biological activities . In addition, the lipophilicity of acetate unit appears to be another important factor for anti-oomycete activity of the compound 6 where the inhibition activity decreased for dihydroxylate 5, which is inactive against Saprolegnia . The compound 1 presents a structural analogue which has been isolated from Stellera chamaejasme L., and which showed good insecticidal property and antifeedant activity . The flavonoid pinocembrin 3 also possesses antifungal property and anti-oomycete activity against Penicillium italicum and Candida albicans and Plasmopara viticola [35, 36]. Finally, the synergistic antimicrobial activity against Saprolegnia strains between the most active compound 6 and the other active compounds (1 and 3) was determined (Table 3). Interestingly, strong synergistic anti-oomycete activity was observed between the compounds 6 and 1 (FIC = 0.25), and with compound 3 an additive effect was observed (FIC = 1.0). Therefore, the significant anti-oomycete effect of resinous exudate is most evidently due to the presence of compound 6 in the exudates, which acts synergistically with the other compounds (1 and 3) against S. parasitica and S. australis. In brief, the results of the synergistic effects of compound 6 reflect its central role in resinous exudate effectiveness against Saprolegnia strains. In summary, six compounds were isolated and characterized from E. illinita resinous exudates, including two hemisynthetic pinocembrin compounds. Furthermore, one new molecule was isolated for the first time from the resinous exudates of E. illinita: (3S,5S)-(E)-5-hydroxy-1,7-diphenylhept-1-en-3-yl acetate (6). Significant antioomycete activities in E. illinita resin and novel natural compound 6 were observed against S. parasitica and S. australis. Based on these results, resinous exudates continue to spark scientific interest in chemistry due to the presence of bioactive metabolites; as an alternative solution to current pathologies; and, from a commercial point of view, due to fast processing and low required investment. AM supervised the whole work. AM and IM performed the isolation of all compounds. ES performed the spectroscopic data. PG contributed with identification and sequencing of Saprolegnia strains. IM conceived and designed the biologic experiments; IM, NC, NE and EW performed the biologic experiments. IM and YO collaborated in the discussion and interpretation of the results. AM wrote the manuscript. All authors read and approved the final manuscript. The authors thank FONDECYT (grant 11160509), Dirección General de Investigación of Universidad de Playa Ancha and Escuela de Obstetricia y Puericultura de la Universidad de Valparaíso. All the authors have given their consent to publish this article. 13065_2019_516_MOESM1_ESM.doc Additional file 1. Figure S1. 1H-NMR spectrum (400 MHz, CDCl3) of compound 6. Figure S2. 13C-NMR spectrum (100 MHz, CDCl3) of compound 6. Figure S3. DEPT 135 º NMR spectrum (100 MHz, CDCl3) of compound 6. Figure S4. 1H-13C-HSQC NMR spectrum of compound 6. Figure S5. 1H-13C-HMBC NMR spectrum of compound 6. Figure S6. HRMS spectrum of compound 6.